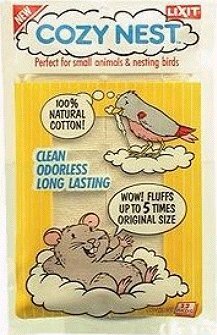 Made from 100% cotton, it fluffs up to five times its original size. However I don't know how absorbant it is. It also comes in a rather small bag so you might need to buy several bags. That could come up to quite a high cost. Even though it is natural cotton, I'm worried about the consequences if it gets ingested by cavies. And you know how those furballs love to chew everything in sight. Although it is not a "dangerous bedding" per se, the fear of complications due to swallowing the cotton leads me to label this product as unsuitable. Expensive 'cos each packet is so small.